(NRSV) Pray in the Spirit at all times in every prayer and supplication. To that end keep alert and always persevere in supplication for all the saints. NIV – And pray in the Spirit on all occasions with all kinds of prayers and requests. With this in mind, be alert and always keep on praying for all the Lord’s people. That’s what we’re going to talk about this morning. Various ways to pray. Isn’t that a refreshing thought – we’ll always be beginners, and that’s okay! 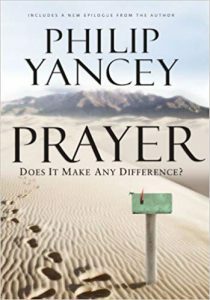 Yancey then asks the question: What exactly should we pray for? We know that prayer is not walking up to God’s Vending Machine and pressing a few buttons to get what we want. Prayer in its essence is communion with God, and realignment with God, placing our lives in the stream of God’s love. But in addition to that, we know we’re given permission in the Lord’s Prayer to ask for Daily Bread, the things we need. What then should we pray for? Yancey then lists a number of things that we can pray about with confidence, prayers we can count on. The Desires of our Hearts – especially when we believe that our desires match God’s desires. We pray for an end to hunger. We know that’s God’s desire. We pray for an end to homelessness – We know that’s God’s desire. 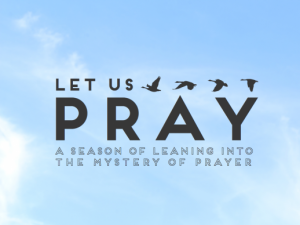 We pray for healing – Jesus was a healer and wholeness for all people is God’s desire. God will respond with mercy, grace and forgiveness! God responds with empathy and compassion. We can be sure of that because that’s how Jesus responded to those who were struggling with what was wrong in the world. 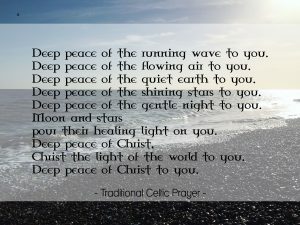 Prayers for Peace – One of the last things Jesus said to his disciples was, “My peace I give you.” God’s desire is for us to know heaven’s peace, the peace of Jesus Christ. Prayers for God’s Presence to be made know. Jesus was called Emmanuel, “God with us.” It’s God’s desire for us to experience God’s presence. Prayers for more compassion and understanding. More & more studies show that practicing gratitude is one of the best things we can do for our emotional & physical well-being. Prayers for more Faith. – God wants to give us more faith! The second half of this message was reviewing the pamphlet, “How to Reconnect with God,” which lists “all kinds of prayers,” for us to pray.